On March 22nd at 9:12 am local time, I was in a taxi heading to the Budapest airport with Szabó Balázs, the well-liked head of Aikido Kobayashi Dojos association in Hungary, when his cell phone rang. I had been in Hungary from March 17~20 for the Hungary Easter camp that had ended with no problems, and was looking forward to my next stop, Brussels, Belgium. There I would meet up with the Soshihan for a first-ever camp abroad where we would both be teaching. Szabó began the call in Hungarian, but then switched to Japanese to say that the Brussels airport had just suffered a terrorist incident, according to Erika, a Hungarian uchideshi. Szabó and I have known each other since 1993, and in that time, he has had three wives and many girlfriends. Several months before, Szabó had separated from his third wife and was single, but apparently was growing closer to this Erika. The day before, she had joined Szabó and me at the hotel's Irish bar for drinks. I thought, well, whatever; it appears to be working. I checked the Brussels airport homepage on my iPhone6. It is sim free, purchased through an inexpensive plan from a Norwegian company. It's different from the Japanese companies in that when abroad, we can connect to the Internet with no outrageous roaming fees. The Brussels airport homepage reported in English that, because of a terrorist attack, the airport was closed down and that details would be posted as information was received, and to please check about individual flights on your own. Next, I checked the CNN website, where there was a "breaking news" announcement, "this morning at 8 am, there had been a terrorist bombing at the Brussels airport departure lobby. Many injured." It was only an hour or so after the incident. No matter who we asked or what sites we checked, no specific details were forthcoming. I immediately called my direct line to my wife. It is a special, no-charge international line for emergencies that I was grateful for now. About twenty minutes later, that line was shut down, so I was especially glad that I called when I did. The taxi finally arrived at the airport. There seemed to be few people and when I checked the announcement board, my flight was listed as "check-in now," so I went to the appropriate counter. A man and a woman were just sitting there; I stood in front of the young blonde staff woman. It's not that I like blondes, or thought it might be better to hear bad news from a woman, actually, she was the closest. "Good morning. I'm checking in for a flight to Brussels, but...." I began, to which she replied with a sad face that I couldn't check in for Brussels, because...."I know," I interrupted her, "there was a terrorist incident, but what am I supposed to do?" "You're now in Terminal 2A and need to go to Terminal 2B and consult with the Çelebi office there. I'm terribly sorry," she said. So Szabó and I walked the three minutes to that terminal, and as we walked, I asked him what the "Çelebi" office was. It seems that even though it was a Turkish company, it handled inquiries for the entire airport. The airport itself was managed by an English company. In Europe, people, goods and services flow freely and mesh nicely, but that's why terrorists can move freely as well. When we got to the Çelebi office, there sat another blonde. She was the only person there. She had a pleasant face, and I asked her as if I knew nothing, "I have a reservation for Brussels, what should I do?" She replied that nothing could fly in or out of Brussels today and that I should check with the Brussels airport tomorrow. "Do you know the Brussels airport number?" I asked, and she looked perplexed at Szabó and just said, "If you look at the homepage...." Szabó chatted with the woman while he searched for and found the number. It turns out that she was a former student of his. Actually, Szabó is a professor at Budapest University, which is the best university in Hungary. He is a professor of Eastern Studies, but I don't think you could tell that by just looking at him. 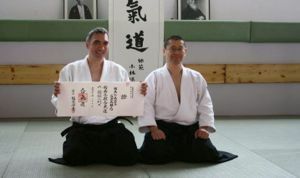 Szabó holding his 6th dan certificate. At least we clearly understood it was not possible to go to Brussels that day. I felt the adrenaline rushing and in order to relax and think about what to do next, we headed for the airport cafeteria for some coffee. As we were drinking our coffee, we heard that the Brussels subway had also suffered a terrorist attack. "Not good; it's not over," I thought, worrying about the Soshihan who was planning to leave Japan for Brussels the next day. I had heard from my wife in a call earlier that the Soshihan had already left for Narita where he would stay overnight before a mid-morning departure. After Brussels, he was scheduled to go to Stockholm and teach at the Easter camp there. We had to change his ticket to Stockholm. I immediately called the travel agency that had arranged his ticket. Even though I had dialed the 050 for an international call, I couldn't get through. I checked the agency's homepage and saw that the company was Thai, so I called the Thai number. When I reached an agent, I cancelled the Soshihan's ticket to Brussels and rerouted the trip from Tokyo directly to Stockholm. The confirmation would come by email, the agent said. 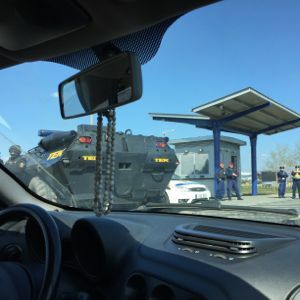 It was barely two hours after the first terrorist incident and it appeared that no one was moving to change their reservations yet. After I got the Soshihan's ticket changed, Szabó concentrated on arranging my accommodations. He managed to reserve two nights at the same hotel I had just checked out of. He was quite adept at using technology, better than any Tokyo professor. After we finished our coffee, we caught a taxi back to the hotel. During the taxi ride, I checked what was happening in Brussels, and I could make contact with a dojo member in that city. I didn't realize before the call that I had met him at a seminar in Dubai and that we were friends on Facebook. He had checked my contact information on Facebook and had immediately messaged me. FB is so fast! The information I got was that nothing was moving in or out of Brussels and when operations would be restored was anyone's guess. Then I got a message from Stephen Toyoda who was en route to Brussels, saying "It looks like we won't be able to land in Brussels." I prayed he was able to get to somewhere safely. About 10:30 am, I checked back into the hotel. It was the same room but an older woman was cleaning the room, so I waited in the hall. Szabó had some work to do at the university, and promised to return at one. Finally in the room, I turned on the TV to CNN where there was a constant stream of images showing the aftermath of the bombing. It was awful. While I was watching the news, Stephen Toyoda contacted me via Skype. He had apparently had arrived in Brussels just ten minutes after the bombing and wasn't allowed to do anything, but he was okay, so I was relieved. At one, Szabó and I went to lunch. All kinds of thoughts had whirled around in my head until then. I was pretty much set on cancelling the trip to Brussels and returning to Japan. Not 100%, but pretty sure. A flight back would have to be secured. The ticket I had was scheduled to leave Brussels on March 30th, returning to Japan via Moscow. I would have to change my departure to Budapest and reschedule a date for the return. Since it was Easter in Europe, there might not be seats available. After lunch, we headed for the Budapest Aeroflot office. No one who could give us answers seemed to be there at the moment. A blonde was at the counter. She seemed to be related to the blondes at the airport, yet different. Are Russians and Hungarians different? I don't seem to be able to see that difference. I'm not saying any blonde is fine, but if she could get my ticket changed.....She stared at the computer screen and tried calling (Moscow), but couldn't get through. She tried calling again and again; ten minutes, twenty, thirty, still nothing. As she showed us a sheet of paper that was in Russian, she explained that because of the bombings in Brussels, nothing would be available until at least the 27th. My flight had been scheduled for the 30th. She said that since she couldn't get through to the head office in Moscow, she couldn't say whether that flight would work or would have to be changed and gave up. She seemed to be saying "I really tried hard and I'd like you to appreciate that." She had that kind of aura, so we just said "spacibo" (thank you) and "dasvidaniya" (sayonara) in Russian very politely. Are Japanese people overly polite? Could we say that implies a false sense of sympathy? Or not? When we left the Aeroflot office, Szabó asked me "Sensei, what shall we do now?" To which I replied, "Okay! Let's have a drink!" We were in total agreement, and if by Providence, there was a bar right in front of us, so we began drinking. 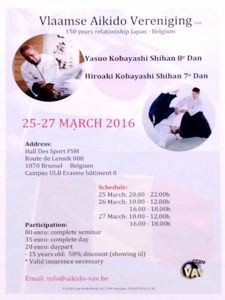 Just as we were beginning to forget the situation, I was contacted by Ms U of Tokorozawa dojo who had planned on attending the Brussels seminar. Reality returned via Skype. Given the circumstances, I recommended cancelling. She had reservations on Aeroflot and was able to cancel with no fee. Japanese time was. Idle of the night, so she said she would cancel the next morning and then the phone cut out. Just having a cell phone is convenient, but having a smartphone that I could use to contact Japan at no cost was wonderful. The rest of that day, I tried contacting the number we were given with no luck. My ticket was a return from Brussels; would I have to go to Brussels? If I had to go to Brussels, should I do the seminar? The seminar was to go on, apparently, according to the communication from Steve. But was the airport open and operating? I thought of so many things. The next morning about four am, I was on to a solution. Since I couldn't sleep, I checked my email and saw that Ms U had written to say that she was able to cancel her flight with a full refund. She also said that Tokyo could immediately contact the appropriate people. Kindly, she sent me the number. A light bulb went on in my head. Why not call Moscow through a Tokyo connection? International calls are expensive, so I would call someone in Tokyo and ask that person call to call for me. A landline. If you put the line on speaker mode, then it could connect with the phone that would call Aeroflot. That's what I did. Choosing who to ask was difficult, because while the line was connected, the cost would be building for that person. None of the instructors had a landline, and it probably wouldn't be a problem to ask a friend, but finally a white arrow pointed towards my wife. I called but there was no reply. It took about thirty minutes to get through. She was about ten minutes away from the house on a bicycle and I asked her to return home immediately. In that time, I faxed my ticket there. To email a copy is simpler, but then she couldn't print it. I had installed a fax function on my iPhone, but this was the first time I had used it. I was nervous as I sent it. It took two minutes to send two pages. It didn't seem as if they had gone through. A little while later, I heard a "piiiiii" sound like a fax going through. Just about that time, my daughter contacted me. She had just gotten back to the house. It was lunch time in Japan, even though the local time in Hungary was 4:30am. Her commute time the school is close to an hour and a half, but if she eats lunch at home, she has more commute time and less school time. I thought that since the tuition for that school was so high, she should spend more time there, but that day it was perfect timing. The fax had arrived and I asked her to check it. Then my wife got home. Connecting my daughter's cell with the landline and setting the phone to speaker mode, I was able to call Aeroflot. Then, timing again, I heard the Soshihan's voice. He had apparently returned from Narita. "I'm back. What am I going to do about Stockholm?" But I couldn't address that problem at the moment; my situation was top priority. "Stockholm is still on. Let's get you there," I said, but I could no longer hear his voice. When I first reached Aeroflot, there was a long menu in English. I felt my wife was nervous. After the menu, there was a musical interlude and then someone answered. My wife hesitantly greeted the person with "Ah, my name is Kobayashi, but....." Then she couldn't say anything more. "Never mind. I want to change my ticket," I said in a loud voice. Two requests. One, change the departure point to Budapest, and two, leave as soon as possible. My wife was relaying my requests, but not very well, when suddenly the agent switched to Japanese. He was Russian and his Japanese level was maybe that of a student at a language institute. Relaying back and forth, the two requests took about twenty minutes. At one point, he said "please wait a moment," and we heard music for about ten minutes. It would've been nice if the music had been a minuet. "There's one seat left on a flight from Budapest tomorrow," he came back, "but the cost will be ¥180,000." "What?!" I thought there might be a charge for changing the ticket, but ¥180,000 was ridiculous. "Isn't there a flight I can get with no extra charge?" I asked. "Just a moment." Silence. We're we still connected? "For no extra fee, you can change the date to June 15th," he said in a monotone. That was nearly three months away. I could hear my daughter burst out laughing. Eh, Papa, you're not coming back until June 15th? Wa ha ha ha ha." I know I'm the one who asked him to check for a no-charge ticket change. However, didn't he hear what I said, that I wanted to return as soon as possible? "I'd like to think about this," and then there was no sound from my end. My wife anxiously asked "what'll we do? What'll we do?" Then suddenly I heard the Soshihan shout "Come home!" That decided it. "Please make the reservations n fI r tomorrow's flight." The conversation was beginning to annoy my wife, so she managed to align the speakers so I could talk directly with the agent. "I understand. How w will you reimburse the cost? Card? Cash? If it's a card and it's not a Russian card, it may not go through, and if that's the case, you will need to pay the amount by 8:30 tomorrow morning at the Aeroflot office in Tokyo," he recited in a tone less voice. My daughter immediately checked the location of the Tokyo Aeroflot office. "Toranomon." Toranomon? That wasn't close to her school. Then from the agent again, "I'm sorry sir, I made a mistake. It's not ¥180,000, it is 180,000 rubles. That's an incredibly painful expense. I checked the internet right away, but no one wants to post that amount for a ticket. I could argue further, I thought, but no matter what I might say, it couldn't be helped. I'm an Edokko (old-fashioned loyal, obedient son). I was ordered to come back and so I must. My MacBook Air that I love received an email. The credit card link was there. I put in my card number and my passport information in a few seconds and pushed the send button with a wing and a prayer. For just a second, I felt proud of myself. Right after that, I got the confirmation that Aeroflot had received the payment. "Is there anything else, sir?" No. "Thank you for choosing Aeroflot," and then the phone went dead. The whole call took over an hour but I had arranged the trip back to Japan. Later, I checked the Aeroflot homepage and it appeared the lines were now open to Moscow. Using a landline, I had called Tokyo from Budapest, and then connected to Moscow, all at no charge. After awhile, my ticket was emailed to me. You can get a seat assignment on Aeroflot, and I could see that I had one from Budapest to Moscow, but none from Moscow to Tokyo. Was it Okayama? Could I get back? Well, let's first get to Moscow..
Online check-in can only be done 24 hours in advance, so I had to wait. At one, I could finally do that, and then I wanted to go to a hot springs. In Budapest, there is a charming hot springs not far from my hotel, one stop by bus, then a ten-minute walk. I waited for it to be one. Promptly at one, the online check-in became available. The check-in could be completed in one process. I clicked on the number and I was done. Nonetheless, I was still anxious about the possibility of overbooking, so I was the first in line for the flight. Whatever it took, I was going back to Japan. I arrived in Moscow with no incident. Now is the main problem. I needed to secure my seat. One hour before boarding time, I was the first in line and was the first to get on. No one else had boarded yet, so chose a seat, took off my shoes and put on my slippers, covered myself with a blanket and cruised into relax mode. I had a magazine and my lovely Kindle I had put in my seat pocket. I radiated "this is my seat." Departure time arrived but still the door was open. It looked like they were waiting for one more passenger. It was a Japanese businessman who was fiddling with his keyboard. That tap-tap-tap was music to my ears. "Boarding completed," I heard the flight attendant announce. That was the first time I noticed that the flight attendant was blonde. Thank you, Ms Blonde. My flight arrived on time on March 25th with no incident. I was back. This trip was especially hard. I wanted to take it easy for awhile but the very next day, I had to teach, and was preparing for the next overseas seminar.